Haguichi provides a graphical frontend for Hamachi on Linux that integrates smoothly into your GNOME desktop. Haguichi is free and open source software licensed under GPLv2. I thought they did not make hamachi for Linux anymore? jordanwb: That seems to be a common theme here on ubuntugeek. They tell you how to install something, but if you don’t already know what it is, you’ll be left scratching your head, searching for an answer. Not something I can use, but I suppose someone might. Hamachi facilitates setting up a VPN easily. 1) Go here & setup a free (non-commercial) account with Hamachi. It took me less than 5 minutes to figure this out. If you don’t think you will ever need a VPN that’s ok, just file for future reference. Can someone confirm that using this on a linux box will allow me to access Himachi running on an WinXP box? Seems silly to have to ask but better safe than sorry. I use logme in to reach my xp boxes from my linux laptop works quite well. Password length is limited to 40 characters when joining a network. So if you use 63 characters to join an existing network you are out of luck with Haguichi. Anon: Ever thought of posting a bug report or simply sending me an e-mail instead of wining on some random website? 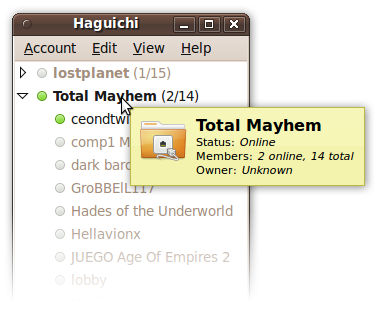 I have a problem with haguichi: I launch it and when I have to login I can’t because I’m not root. I can’t even have the choise to put the root’s password.